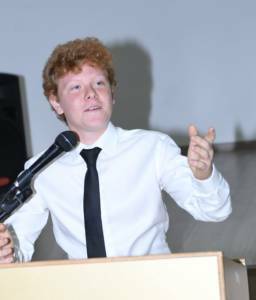 Each Young Ambassador took the stage dressed in white shirt and tie, as befits diplomats and – in under two minutes – succeeded in convincing their audience on an agenda of burning issues. This is how Israel is preparing the next generation of social leaders in Israel, talented ambassadors who can navigate boundaries with patience and tolerance, acceptance and openness in interpersonal communication. Our new Young Ambassadors from Zev Boim Sci-Tech School in Kiryat Gat, are talented, dynamic students who’re learning to influence and shape world public opinion with regard to Israel’s image and branding. 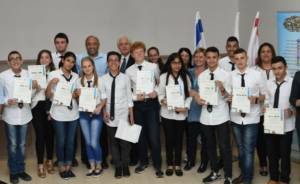 The purpose of the project is to encourage young people to be engaged citizens and contribute to the State of Israel in which it will be able to represent the international community and then be integrated into the country’s future leadership. Applauding them proudly were Mayor of Kiryat Gat, Aviram Dahari, Director of Education Mrs. Zahava Gur and Ambassador Yitzhak Eldan, who is overseeing the project on behalf of the Multidisciplinary Center for Educational Entrepreneurship. Their first task at the program will be to meet with youth from European countries and enhance their eyes the image of the State of Israel. 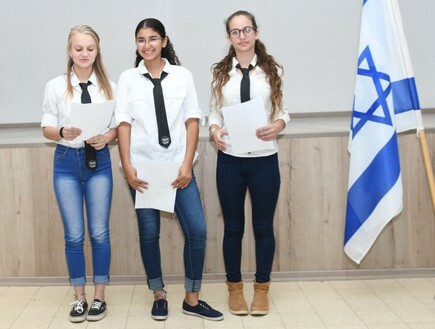 Students have been trained in weekly sessions throughout the year, learning skills related to leadership, Jewish identity and knowledge of Israel.At today’s ceremony, each student presented their prepared speech and had less than two minutes to convince the audience on issues like the social attitude of Holocaust survivors, the importance of sport, veganism, anorexia, junk food, the dangers of social networks, outlines gas, alcohol and fake, volunteering in the community, caution drugs, army recruitment. This school year, when students are in the classroom, they will step in, and this time will focus on speeches in English. Read about our similar program, Eye2Israel programme, in partnership with the Ministry of Foreign Affairs. Hundreds of young reporters are our online ambassadors, and they’re reaching thousands.